Learn to master the most powerful class in the game. Meta = Most Effective Tactic Available. This guide is intended for players of all experience levels who want to make the most out of the GS class. Headshot and headshot only. This is a general rule for KF2, but it's even more important if you want to play Gunslinger well. Not getting headshots as a gunslinger is like not using melee weapons as zerker, or playing survivalist; you just don’t do it. Now you might be thinking, "But why shouldn’t I just play SS if I need to get headshots?” Life lesson my Padawan: Sharpshooter is for babies who want to sit in a corner and be useless until a big zed shows up. Gunslinger is for badasses who want to excel at killing absolutely everything. BUT ONLY IF YOU PLAY IT RIGHT. 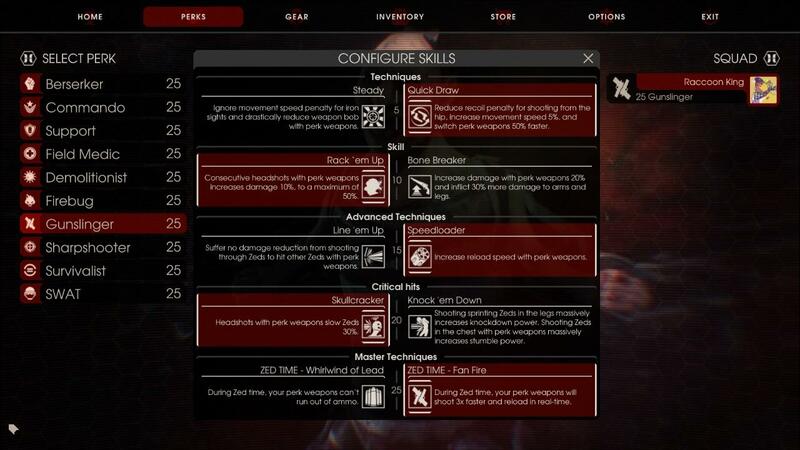 The Gunslinger's high mobility and high DPS (damage per second) allow him to effectively kill hundreds of trash zeds and still drop a fleshpound in 5 seconds. A. The skill "Rack em Up” increases the damage you deal every time you land a headshot (stacks for a max of +50% damage. Combined with a level 25 GS's passive damage (+25%), gives you a whopping +75% damage with perk weapons). For hopefully obvious reasons, this is THE most powerful skill in the GS tree. Stacking REU significantly reduces the TTK (time to kill) of both normal zeds, but more importantly large zeds. B. Since GS’s primary weapons are pistols, his ammo pool is lower than most other perks. Scoring headshots as often as possible is an effective and necessary method of conserving ammunition. First of all ALWAYS TRY TO HEADSHOT. I don't care if it's crawler, a scrake, or a practically invisible stalker (there is only one zed you should not headshot and that's the husk, shoot his backpack). It will only get easier if you TRY. Plus, this is exactly how GS is effectively played. Headshotting every zed you see keeps the REU damage bonus up, which not only makes missed headshots less punishing, but increases your battle readiness in the event that a big zed shows up, thus making your job easier. Memorize where the center of your screen is (i.e. where the bullets will go). Feel free to turn on the crosshair to assist you in this process (and leave it on if you prefer). Have a high framerate. If you have to make the game look like it runs on the Nintendo 64 to get 60 fps, do it. You won’t be able to headshot with anything less. Find your preferred aim sensitivity. Straightforward enough, find a value that’s fast but easy to control. Memorize the general movements of the zeds. In other words, how they move their heads when running, walking or attacking. 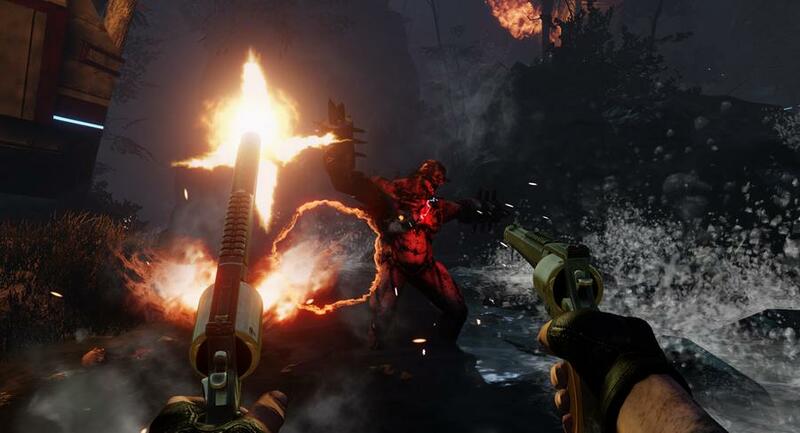 For example, the fleshpound moves his head in a side to side motion as he begins to rage. Try to predict where their head will be so you can land that perfect shot. Do NOT try to headshot a zed that is not walking towards you because you will probably miss. Do NOT ADS (aim down sights) EVER. This is counterintuitive to becoming a good GS. You should be able to headshot without using the sights as it will increase your DPS massively and generally be more convenient. Unlike SS and Firebug, a Gunslinger's role is not restricted to just large or small zeds. A good GS excels at both trash clearing (i.e. normal zeds) and large zed elimination. Make no mistake however, large zeds should be your priority when you see them. Quickly check behind you to make sure there are no additional enemies. You should also be looking to make sure there is plenty of space to walk backwards (preferably in a straight line). Equip your most powerful weapon (Magnums if you have them, if not then Deagles). Also ensure he is walking towards you and not another player. Walk backwards while firing at his head. When you run out of ammo, switch to Deagles (or reload your magnums if there’s enough distance between you and the zed). Protip: Jump as a big zed is about to hit you. This will throw you backwards and make it impossible for them to chain additional follow up hits. This is your skill selection. Accept no substitutes. Gives you a ton of great bonuses. Reduced recoil, additional movement speed, and faster weapon swapping. As I’ve explained, this is GS’s most important skill. You can get up to 50% extra damage versus the measly 20% offered by the alternative skill (and why you would want to do extra damage to limbs is beyond me). This is the only skill in the GS tree that is optional for experienced GSs. Speedloader reduces your reload time significantly, but can be substituted by animation cancelling (See the "Animation cancelling" section of this guide). This is a decent bonus since you’ll be getting headshots anyway. 30% decreased speed to zeds isn’t really enough for you to outrun them, but it can still make the difference between life or death by giving you and your teammates some extra time to deal the killing blow. In any case, there is really no benefit to knocking down zeds as it just makes it more difficult to headshot them. Our final and very useful zed time skill. Naive players may be tempted to choose Whirlwind because INFINITE AMMO, but fail to note that your weapons will still fire in slow motion during zed time. Thus, entering zed time with a full mag gives you more or less the same effect as Whirlwind would. Simply put, you won't be able to fire off enough rounds during zed time for infinite ammo to actually matter. FAN FIRE not only lets us shoot in real time during zed time but reload in real time as well. This means that given the correct circumstances, we can dump a full magazine into an enemy’s head during a single zed time execution (3 seconds) and still be ready and loaded by the time it ends. Note that recoil is greater during zed time with this skill, control your shots. Protip: If you're stuck in a slow animation during zed time with this skill, swap weapons. Your strategy for bosses is... you guessed it: headshots. Yes this can be a bit more difficult which is why you must pick your shots more carefully. Hans is a terrible boss to deal with in general. He is much harder to hit than the Patriarch as he likes to slide around in his annoying suit. You want to have your Magnums out to start with, then take slow but steady shots at his head as soon as you see him. You generally want to be at a middle ground in terms of distance. Too far and you won't be able to land any headshots, too close and he'll probably slice you up with his bayonets. In addition, being closer allows you to take advantage of any openings that may appear. For example, a demo's explosion might knock Hans down, allowing you to run up and pop some rounds in his head. A sharpshooter's freeze nade can also briefly immobilize him. Once Hans' shield goes up, you'll want to fall back a bit so that he doesn't grab you. Ideally, your team will break his shield before he can drain someone, but if he grabs someone, make sure it isn't you. As soon as Hans grabs another player, you'll want to pull out your Deagles and run right up next to him and start unloading into Hans' head. Combined with your teammates' support fire, this should break his shield almost instantly. The next time his shield goes up will be a bit more difficult because it can absorb even more damage. You will want to repeat the same general strategy, although you may want to start using the Magnums instead of Deagles to compensate for his stronger shield. The Patriarch is a piece of cake compared to Hans. He moves much more slowly and often likes to stop and stand in one place for a few seconds. The difference here is that his head can be bit difficult to identify since it's practically in his torso. Just as with Hans, you want to start off with the Magnums and take slow and steady shots at his head. In the event that he turns his back on you, you will not be able to headshot him, so feel free to aim for his glowing green arm which is a weak spot. Again, you want to be at a middleground from him, but this time you want to be sure there's plenty of solid cover. If he catches you in the open with his minigun you're screwed, period. With a good team, the Patriarch's health should go down very quickly. As soon as his health bar changes color, you want to pull out your Deagles and just unload on him. It's preferable if you hit him in the head or arm, but the point is to maximize your DPS so you can kill him before he runs away and heals. Once again, this will usually only work if the team helps you out. Smart players will try to box him in by surrounding him and blocking his path and this usually buys enough time to kill him before he can escape. Note that it may be helpful to purchase the M1911s on this final wave for trash killing so that you can conserve the ammo of your more powerful weapons. is the second most important skill for a GS to master behind headshotting. You may or may not have noticed that when you reload some weapons, the ammo counter will refill before the animation is actually completed. This means that the weapon actually IS reloaded at that point, but how do we shave off those extra seconds of animation? In order to do so, simply hit the bash key (defaults to V) once the counter updates. Note that if you do this too early, you will have to restart the reload, so practice your timing. Almost all class weapons allow this, but because of their low ammo pool, Gunslingers benefit the most from this technique. Combined with the Speedloader skill, a GS can almost always have a full mag ready because animation cancelling brings his reload time down to a mere 1-2 seconds. Animation cancelling is actually easiest using GS weapons because the weapon is loaded as soon as you hear the first magazine click into place. Use this as a reference point for timing your bash. Note that an animation cancel will not work on the Magnums using Speedloader (the reload time is the same as the animation). There is, in fact, an even faster way to cancel animations. To do so, press and hold mouse 1 after you start the reload. As soon as the ammo counter updates, hit V (bash). This will skip the bashing animation and immediately fire the weapon. Protip: Swapping weapons after the counter updates also cancels the animation but leaves the weapon reloaded. Use this to quickly reload all weapons in your inventory. Since the cross perk update, GS gained bonuses with a lot of new weapons. The only weapons you should be using if you want to play seriously however, are the pistols. The following overview covers only these weapons. You start with one of these. Reliable fallback, but don't use it as a primary. Do not buy dual 9mms as their minimal damage isn't worth the cost. You start with these. Many players seem to hate them but they are actually decent on the first wave but will inevitably run out of ammo before it ends. Use these over the single 9mm because they have higher DPS and be sure to make use of animation cancelling to skip the long reload. Sell immediately. My least favorite weapon. High fire rate, decent damage, but the recoil acts differently than on other GS pistols, thus making it difficult to control. It's better to upgrade straight to the Deagle. All-rounder and your best friend. The Deagles are every good GS's bread and butter. Good fire rate and great damage allows the Deagle to excel at trash disposal and is quite reliable against tougher enemies too. The most powerful handgun in the world GS's arsenal. As you'd expect, they do incredible damage for their pricetag, but reload rather slowly and only hold 5 bullets each at a time. Use only for big zeds. This is your class specific grenade. It can stun things but isn't very reliable at doing that. Use it like a normal grenade and be careful not to stand too close. If you're doing things right, you don't need more than this, and anything else you buy is just money wasted that could have gone to your teammates instead (what exactly do you plan on doing with that $600 katana?). Your first purchase is the Deagle as it does excellent damage for its price. By the 3rd wave you should already have Dual Deagles. After this you want the 500 Magnums, again buying only one at a time. I recommend that you try to avoid using it until you have two of them. By wave 7-8 you should have finalized your loadout with Dual Deagles + Dual Magnums.